April 29, 2016 – Los Angeles, California. Key Housing, a top-rated corporate housing service for the Los Angeles area, is proud to announce that their Google+ social networking site “Key Housing Connections” has surpassed 140,000 views as of April, 2016. Maintaining this site as outreach to those who may be in need of Los Angeles corporate housing in one way in which Key Housing is helping those people looking to find quality housing in what is one of the tightest apartment markets in the United States. To view the Google+ listing, visit our web page, click on the ‘blog’ link, and scroll to the very bottom to the Google+ link. The next step would be to triangulate, and test the amenities available in this area against a given person’s priorities. Yes, the Vantage has great access to shopping and nightlife, but it is too far from public transport such as Metrolink? The access to green space here is excellent (Runyon Canyon Park is adjacent) but perhaps a location closer to the ocean would be preferred? In the final analysis, there is a place for everyone in the sprawling metropolis that is Los Angeles. Key Housing is here to aid on that journey. 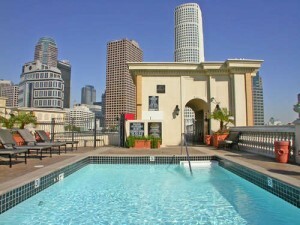 To browse other available Los Angeles corporate housing please visit http://www.keyhousing.com/GMcontact.asp?location=Los+Angeles. At both locations, one can easily browse a wide-ranging options of available short-term housing for corporate renters available in the city. Interested parties can also reach out to a consultant for more person-to-person assistance. Availabilities for corporate renters cannot be guaranteed; however, Key Housing has many other available opportunities in the hot Los Angeles, California, and SoCal rental market. Interested parties are recommended to either use the website, or contact Key Housing directly for personal assistance with their Los Angeles temporary housing needs. This entry was posted in Press Releases and tagged Los Angeles Apartment, Los Angeles corporate housing, Los Angeles Furnished Rentals on April 30, 2016 by Lee McDonald.